Premise: The Art and Art History Department at Agnes Scott College funds a program called “Senior Select” that allows senior Art Studio and Art History majors to purchase a work of art. The process begins with a proposal session where we discuss the works in the annual Art Papers auction in Atlanta, GA. Once the department has decided on their favorite works, the students and professors attend the art auction. At this year’s 2013 Art Papers Auction, the Agnes Scott purchased Beige, 1951 by Bethany Collins. At the Senior Select Reveal, where we revealed the work to the public, I gave an introductory speech about Collins and the work, which I have posted below. I will be posting my interview and wall text for the work at creativeagnes.wordpress.com in the near future. Bethany Collins, originally from Montomery, Alabama , now lives and works in Atlanta, GA. She received her BA in Studio Art from the University of Alabama, Tuscaloosa and her MFA in Drawing, Painting & Printmaking from Georgia State University. Her work has been prominently shown throughout Atlanta area at institutions such as MOCA GA, Mason Murer Gallery, The Goat Farm, and Hartsfield-Jackson Airport. She has had solo exhibitions at the Arts Exchange Gallery and Georgia State’s Welch Gallery. She is currently a Walthall Artist Fellow and an instructor of Art Appreciation at Chatahoochee Technical College. Collins’ most recent works focus on concepts of defining self in relation to race through the medium of educational materials, such as chalkboards and dictionaries. This work, titled Beige, 1951 from Bethany Collins’ “Dictionaries” series, depicts a Webster’s New World Dictionary definition of the word “beige.” In this series, Collins examines the language that we use to describe race, and more specifically, the language that has been used to describe blackness. While most of the definition of “beige” is erased, the word “grayish-tan” and its classification as an adjective are still present. The words Collins chooses in her “Dictionaries” series are all descriptors of blackness and often of colors, while never actually depicting the colors themselves. The photo-transferred text on white paper alludes to an authoritarian voice, much like one would hear in an educational setting. The contrasting black against white serves as a stark visual and metaphorical differentiator for the descriptor of blackness on a foundation of white, American Masters paper. While the remaining words of the definition focus on literal color, the erased definition consists of remnants of color left behind by an oversized, pink eraser. Despite the acceptance of dictionary definitions as objective, especially in educational settings, the 1951 date, indicated in the title, compels us to consider this definition of “beige” as an excerpt from an historical document. 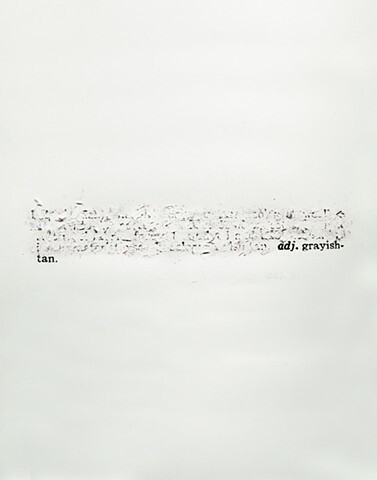 The literal residue of the erased language serves as a visual reminder of the evolution of language, the taking from old definitions in order to form the new. By examining binaries and the lines that we draw between each other, Collins reveals the grey area of individual and collective identity. In order to describe this tension, the artist quotes author Rebecca Walker, who refers to “the black outline around my body that everyone else seems to have.” Held in a Southern, collegiate collection, Beige 1951 implores us to more deeply question the history and language of our own identities and the development of those identities in our academic community. The erasure, still present despite the absence of the words, reminds us of the powerful nature and history of language: what is said is never truly lost.